In the Klosterkirche of Riddagshausen you can see a nice old organ case. 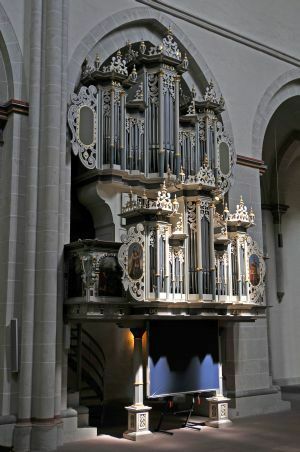 Appearances are deceptive, it is a neo-baroque organ from 1979, build by Alfred Fuhrer (not a small builder, there are more than 700 organs from his workshop). He used the case of the original Ruckpositive and imitated the case for Hauptwerk/Brustwerk from the original organ from 1619 (build by Heinrich Compenius). Neo-baroque organs can sometimes be very 'sharp' in sound, I don't experience that however with this organ, perhaps it is because of the huge reverb. The church in fact has tremendous acoustics. 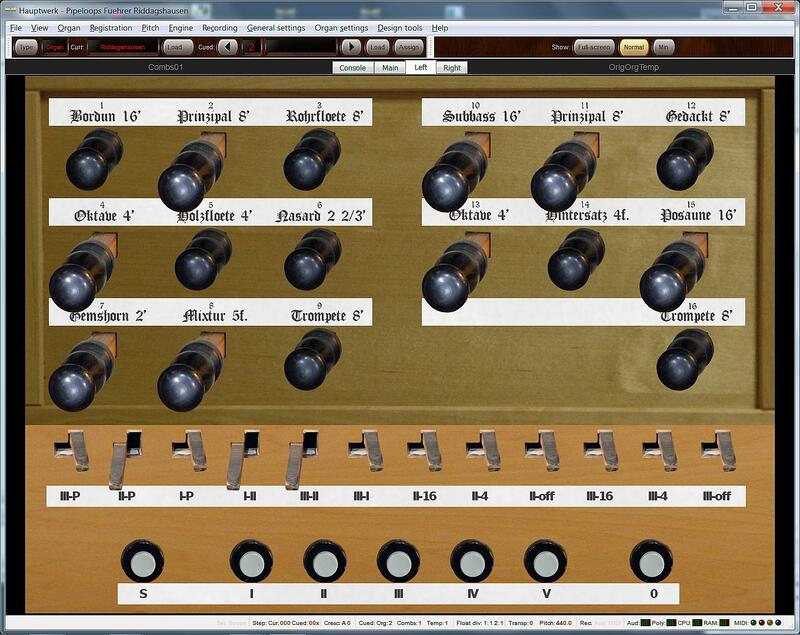 However, the sample set maker was very effective at producing a good balance between direct sound and reverberation. 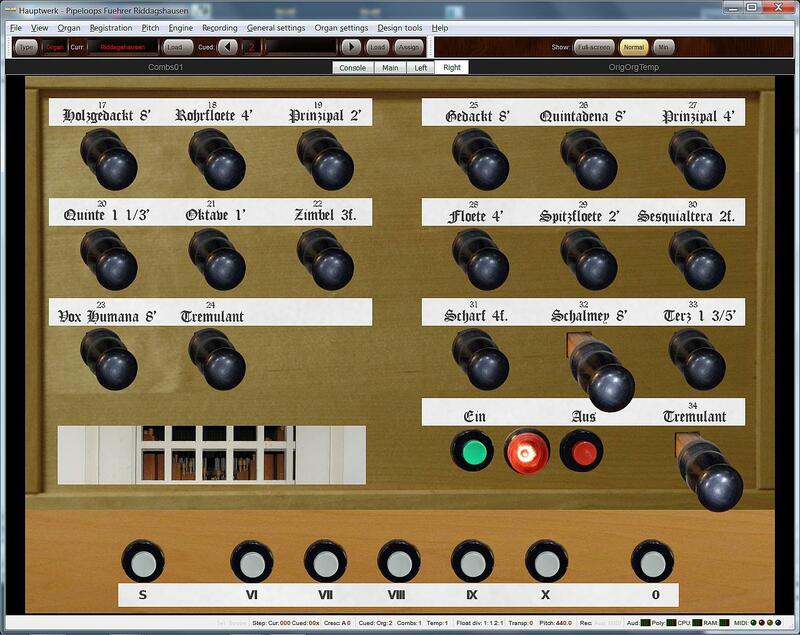 Of course also thanks to the neo-baroque character, the organ will sound clear and no notes are lost in the reverb. The stops 'mix' well, but some details are lost in the huge reverb. This effect seems less apparent with headphones than through speakers. For 'tremulant fans' this organ is fantastic, all the stops of both Ruckpositiv and Brustwerk have also been recorded separately with tremulant. This results in very realistic tremulants (you even hear the sound of the tremulant engine). In my examples below I could not resist the abundant use of the tremulants, because there are (still) almost no other sample sets with such a beautiful tremulant sound. A neo-Baroque organ in a case from 1619 of course has no strings, too bad ... Although the reverb and the recorded tremulants are wonderful, a romanticist certainly encounters some restrictions. You don't have soft strings and also an 8-4-3 sound with tremulant (a typical Dutch curiosity) is not possible with this organ. I would also like to have a (soft) Principal 8' in the Brustwerk and Ruckpositiv, probably these had to be omitted due to lack of space (length). Moreover it is a bit strange that the Hauptwerk contains no Octave 2'. Flutes and aliquots are plentifully available. The Ruckpositiv Floete4 is a special one: The bottom octave is normal (soft), starting from tenor-C the flute is overblowing ('harmonique'), listen to the demo Clemento Part 1. In the middle octave, perhaps due to voicing problems, the flute also sounds at its fundamental (which it shouldn't), but very slightly off-pitch. Such peculiarities give an organ its distinctive character, something you will not find on an electronic organ. Besides, in the bottom octave the Quintadena has no pipes of its own, the Gedackt is played instead. Also each keyboard and pedal features a reed stop with distinctive character, you can use them as solo-voice (e.g. with tremulant!) and as an addition to a plenum. If you combine on the RuckPositiv the Gedackt 8, Principal 4, Spitzflote 2 and Sesquialter you will get a nice Cornet sound. There is a clear distinction between the different keyboards: The Brustwerk is the softest, the Hauptwerk has the most reverb, and the Ruckpositiv sounds most directly. 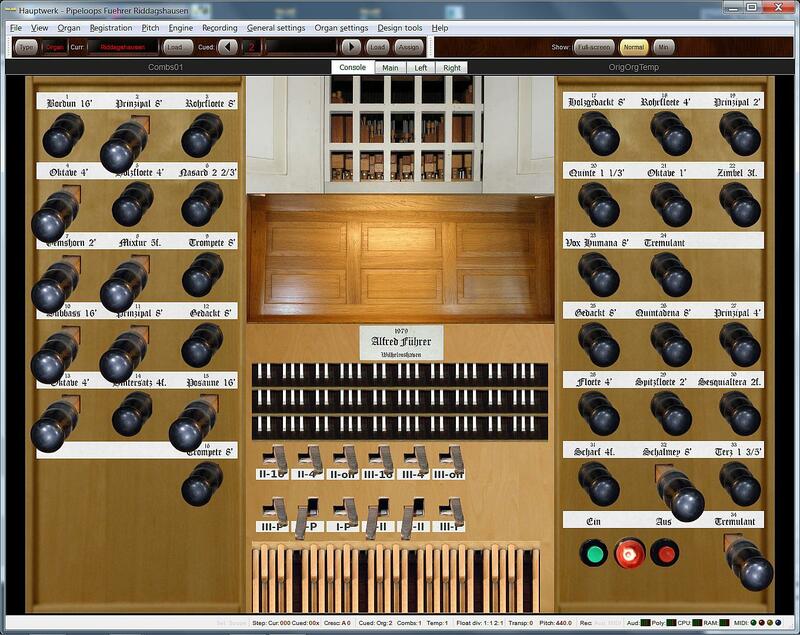 On the real organ you can influence the loudness of the Brustwerk by manually opening and closing wooden doors. 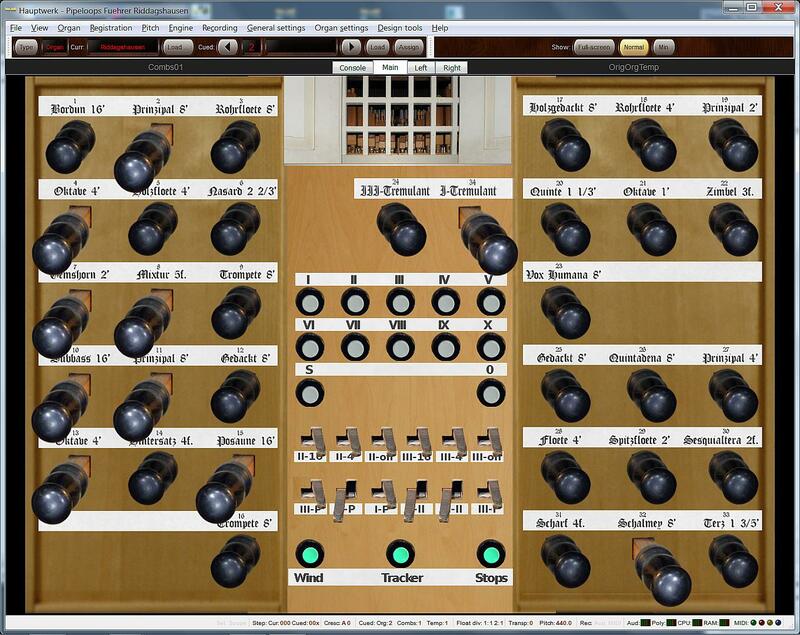 This is modelled in the sampleset via an 'expression pedal', you can even see the doors open and close on the screen. This is very handy and nice! Not so convenient: Since I didn't see an 'expression pedal' on the screen; I overlooked this feature the first time. I find the volume of Brustwerk very (too) soft, even when the doors are open. The user interface screens (Console, Main, Left and Right) are pretty and easy to use (big buttons, good readable labels). You can even switch on/off the recorded sound of wind engine/tremulant engine, key noises and pull knobs with simple buttons. At the real organ, there is very little space between Hauptwerk and Ruckpositiv, so I find no detailed picture of the real console. But it seems that the user interface screens are quite realistic. Two free trial options are provided for the set (download from website of Pipeloops); this is an ideal way to assess whether you include the excessive reverb pleasant or even intrusive. The full disposition, but the sound will stop for a while every 45 seconds. You can load the full set (including tremulant samples) in 5.47 GB (computer needed with 8 GB RAM) for 16-bit, for 24-bit quality you need 10.50 GB (computer needed with 12 GB RAM). Personally, I think that this set comes into its best when playing with headphones. Because I am a lover of both a beautiful reverb as well as tremulants, I find it a nice sample set for an average price (E 295, - / E 9,20 per stop). Those who like a neo-baroque organ with a clear sound and lots of reverb, beautiful tremulants and 'historic is not a must' can have a lot of fun with this set.